Most of America might look forward to Memorial Day because it gives us a three-day break from our hectic work lives and an excuse to grill great gobs of red meat over an open pit, but it’s intentions are much nobler. The establishment of Memorial Day as a day of remembrance for the men and women who bravely gave their lives in defense of their country hasn’t gone totally unnoticed. Communities all over the country attend public memorial services, lay wreaths for the fallen and wear red poppies before starting their barbecues and enjoying the freedom that so many have sacrificed for. The holiday itself is steeped in traditions with their own unique origins and evolutions, some of which didn’t start in America even though they have become American traditions. Here are 10 things you might not know about Memorial Day. Memorial Day has its roots dating back to the Civil War when communities would hold a similar holiday called “Decoration Day.” According to the book ‘Don’t Know Much About History,’ it started in 1865 when northern abolitionist James Redpath organized schools for freed slaves in South Carolina to scatter flowers on the graves of Union soldiers. The tradition carried to the South for Confederate soldiers’ graves and Decoration Day became an annual tradition. Several towns claim they were the first to hold Memorial Day services, but the government officially recognizes Waterloo at the birthplace of the holiday. The town claims that local druggist Henry C. Welles suggested organizing a remembrance service at a social event. Plans were made with Welles and Civil War Gen. John B. Murray for the following year and the tradition continued. 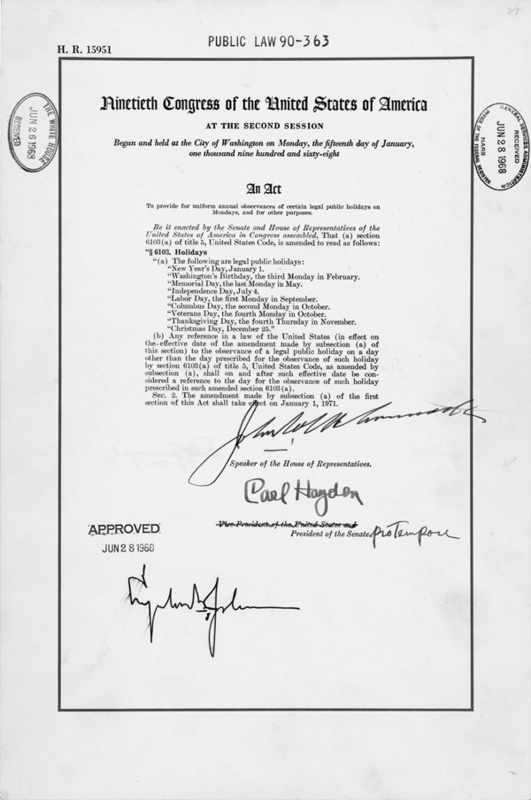 President Lyndon B. Johnson signed a proclamation honoring Waterloo as the “Birthplace of Memorial Day” in 1966. The Civil War had torn a deep canyon between the North and the South, long after the final shot was fired and these attitudes reflected the rift in the way either side celebrated their Memorial Days. The dates for the South’s celebration, “Confederate Memorial Days,” ranged from April to late May in different parts of the region except on May 30th since they considered it a “Yankee” holiday. This rift and the deaths of the country’s remaining Civil War veterans caused the holiday to slowly fall off the calendar year after year and it almost disappeared by the beginning of the 20th century. The breakout of World War I and World War II prompted its resurgence and a call to honor the fallen soldiers once again. Veterans’ groups were able to successfully lobby for the establishment of a national holiday on May 30th, the official unofficial day of remembrance. Memorial Day might be steeped in historic tradition, but it’s actually much younger than you might think. The federal government didn’t officially recognize it as a holiday on the calendar until 1968 when LBJ signed the Uniform Monday Holiday Law. The bill recognized a number of “legal public holidays” including New Year’s Day, Washington’s Birthday, Independence Day, Labor Day, Columbus Day, Veterans Day, Thanksgiving and Christmas. Instead of the May 30th date that veterans had lobbied for, the bill established Memorial Day as “the last Monday in May” giving everyone the three-day weekend they know today. Another solemn tradition of Memorial Day is the wearing of a red flower nicknamed the “Buddy Poppy.” According to the book ‘The Decoration/Memorial Day War,” the tradition actually came from a poem written by Lt. Col. John McCrae of the Canadian Army during WWI who worked as a surgeon during the war. During the Second Battle of Ypres, one of his students was killed by artillery shell burst and the loss affected him greatly. He was moved to write a poem titled “In Flanders Fields,” but rejected it before trying to get it published. Another officer read the crumpled poem and published it for him in a London magazine. A few years later, Moina Michael, an American native working in Scotland for the YMCA’s Overseas War Secretaries headquarters, read McCrae’s poem and was so moved by the line, “In Flanders fields the poppies blow, between the crosses, row on row” that she vowed to wear a red poppy in honor of the fallen soldiers. She began selling poppies when she returned to the States a couple of years later on what she called “Poppy Day.” Meanwhile, Anna E. Guerin of France had heard of Michael’s work and formed a partnership to sell Michael’s poppies in their respective countries while donating the proceeds to charity. Soon, demand grew as the Veterans of Foreign Wars established the red flower as the official memorial flower and a factory was built in Pittsburgh in 1924 to produce the fake red flowers. The US Patent Office registered the “Buddy Poppy” and it became the official flower of remembrance for the special day. Memorial Day might be full of sleeping in and getting full on backyard barbecue but it is not without an opportunity for personal reflection. President Bill Clinton established the “National Moment of Remembrance” in 2000 to give everyone a chance to reflect on the true purpose and sacrifices that should be honored on Memorial Day. The proclamation established that 3pm be the official time for the moment, the same time when television and radio stations often play the traditional ‘Taps’ to give Americans pause during their busy Memorial Day. The traditional has continued to this day with President Barack Obama adding a “Prayer for Peace” establishing 11am “as a time to unite in prayer” on Memorial Day. The earliest known use of this tradition occurred in the 14th century when warships would fire seven cannon salutes to honor their fallen soldiers. Cannons were also fired on land because it offered easy access to a large stockpile of gunpower needed to fire three cannons seven times.